La’Juan Powell lives her life by putting other people before herself. A member of the beta class in Concordia University Ann Arbor’s School of Nursing, La’Juan will graduate in spring 2019 with her Bachelor of Science in nursing—a degree she has patiently waited to pursue for 10 years. The journey to become a registered nurse has been anything but comfortable for La’Juan. As a 35-year-old mother of three, her contagious kindness is met with uncommon grit and determination as she balances the many demands of a family, a third-shift job, and full-time schooling. At the time, La’Juan owned a child care business that looked after dozens of children before and after school. She and her husband were beginning to start a family of their own, and La’Juan knew that her grandmother would need a heightened level of medical support. To help her grandmother, La’Juan decided to change careers and become a nurse technician. Shortly after, she was offered a job in the cardiovascular intensive care unit in the hospital at University of Michigan. 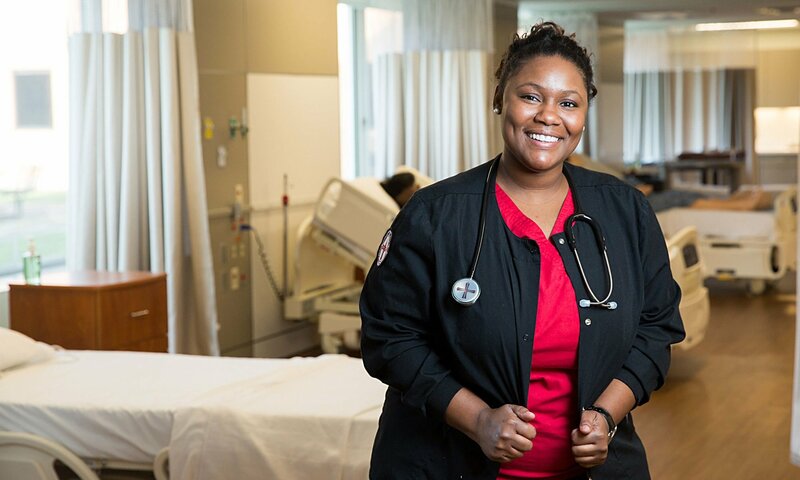 La’Juan supported her family while her husband finished his schooling, but always knew that she wanted to become a registered nurse and give patients a more advanced level of care. Eight years into her career as a nurse technician, it was her turn and she chose CUAA’s School of Nursing for its compassion-centered, faith-based curriculum. Recalling her first semester in the nursing program, La’Juan took a wellness course with Cindy Fenske, DNP, RN, CNE, dean of CUAA’s School of Nursing. “I just remember sitting there thinking, ‘Wow, here we go! This is awesome.’ It’s very tough, but it’s so good,” says La’Juan. La’Juan notes that she would not be successful in her studies if it weren’t for her faith that keeps her grounded and the support of her family and her professors, but she also has a special gratitude for a cohort of classmates who push each other both in and out of the classroom. While the fulfillment of a four-year college degree is an incredible accomplishment, La’Juan is not satisfied with simply doing great things. She strives to also be a great person. With compassion that is bursting at the seams, La’Juan knows that as a nurse, she is able to come alongside patients and their families through some of their toughest days and do what she does best: take care of them.